» Best Time To Visit : May To October. Also popular as a hill resort destination, Manali presents some excellent and well-equipped accommodation choices for the tourists. In the past decade Manali has turned out to be one of the best hill resort destination of India, particularly in those resorts, which cater Indian domestic tourists and honeymoon couples. But the ideal places to stay are the small guesthouses, providing a tranquil atmosphere of the Himalayas for those who are looking for solitute. Hadimba Temple : Hadimba or Dhungiri temple in Manali is one of the most important temples in the region. This four-story wooden temple is located in the middle of a forest called the Dhungiri Van Vihar. Tibetan Temple : Tibetans have a base in Manali too. There is a large modern Tibetan temple to the South of the bus stand and also a small handicrafts centre. Arjun Gufa : On the left bank of the Beas, 5-km from Manali near the village of Prini, is the 'Arjun Gufa' or the cave of Arjuna. In here Arjuna practised austerities to get Pashupata Ashtra or weapon from Lord Indra. Rohtang Pass : Rohtang Pass is the highest point, 4,112m, on the Manali-Keylong road, 51-km from Manali town. It provides a wide panoramic view of mountains rising far above clouds, which is a sight truly breath-taking. Check out the Manali Hotels & Resorts Guide, offering a list of options to get online Hotel bookings and instant hotel reservations before planning your trip to Manali. 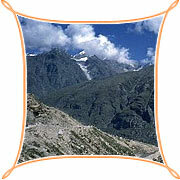 Air : The nearest airport to Manali is that of Bhuntar, which is 52-km from Manali. From Bhuntar one can take a taxi or a bus to Manali. Rail : The nearest railhead is that of and this narrow gauze railway station is 95-km from Kullu. The scenic beauty of Kullu while going to Manali can best be enjoyed on a bus or a taxi. It is better to take a taxi, which one can stop and enjoy the nature at will. Road : The road to Manali passes through the picturesque valley of Kullu. The motorable roads to Manali connect the town with other major tourist places in Himachal as well as in the nearby states. At the Manali bus stand there are two booths, which do computerised reservation for buses. The reservations can be made one month in advance. Both private and state government buses are in service over here.